Skutt Kilns Enviro-Vent DUAL INTAKE KIT [Add $149.00]Dual Intake Kit for venting two kilns or kilns over 12 cubic ft.
Skutt KilnLink Cloud Based Monitoring System. Select if you would like information on adding this. 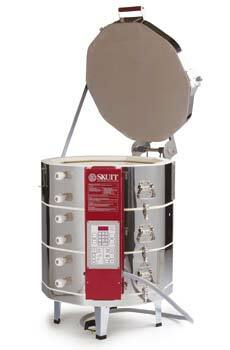 Sometimes called the energy saver the Skutt KM 1027-3 kiln is known for its ease in reaching cone 10. With it's 3 inch fire brick it is able to reach cone 10 in 240 or 208 volt single or 3 phase time and time again. The KM 1027-3 firing chamber at 6.4 cubic feet provides plenty of room for larger stoneware or porcelain loads. The addition of the Skutt EnviroVent will help get the most from the kilns automatic firing capabilities. Single Phase electric pottery kiln for residential and commercial power. Chamber: 22-3/8" opening, 27" deep, 6.4 cu. ft.
Cone 10, 2350 degrees. Also available in 3 phase models. 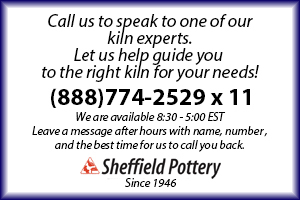 All Skutt 10 and 12-sided kilns come with a Lid Lifter as a standard feature. These spring-assisted lids are so light you can lift them with a finger. 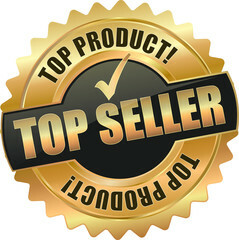 Compare them to other brands and you will feel the difference. Every Skutt lid is coated with a strong, long lasting refractory cement that prevents brick dust from falling into the kiln and improves the lids structural integrity. Since both sides are coated, the lid can be reversed for double the life. 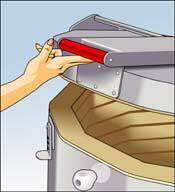 A 2-position, lid brace is included for additional safety and convenience. Choose your options above and order today !